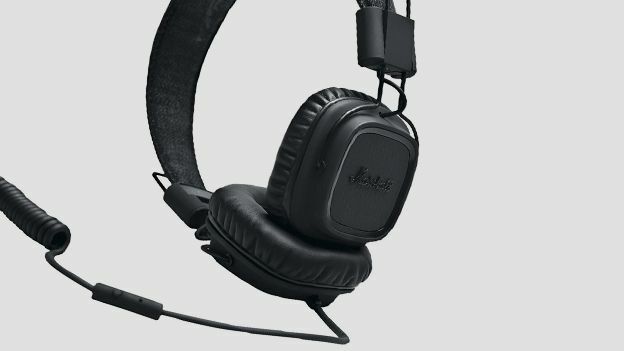 Do the Marshall Major Pitch Black headphones do the audio giant justice? When Marshall audio equipment arrives, we always expect the best. But do its latest headphones deliver the quality we expect from this iconic brand? Marshall of course, is a brand synonymous with quality and durability in the audio industry. After decades making indestructible guitar amps and speakers, Marshall dipped its toes in the consumer market in 2010 with its first Marshall Major headphones. The design is an interesting mix of textures. The striking design point of these headphones of course, is that they're pitch black, with the only flicker of white coming from the stitching underneath the denim headband. The Majors fold neatly to be packed away, just like the B&W P3s (even it they're quite as compact). But they're still sturdy and don't feel brittle or cheap when you're adjusting the position of the ear-cups or folding them up. When these headphones rocked up in the office, with the Marshall logo emblazoned across the side of the box, the first thing we were expecting was that they would be loud. Not just max volume loud, but properly OMG CAPS LOCK LOUD. WE WEREN'T DISA- sorry... we weren't disappointed. Seriously, we recommend that you start off fairly low volume because for the majority of you, these headphones will be significantly louder than what you're already using, and we wouldn't want to be responsible for you damaging your ears. We're sure Marshall wouldn't want to be either. Given that these headphones are naturally loud, and the cups are on-ear rather than fully enclosing the ear, we were expecting some significant sound leak. Surprisingly, there's really not much excess sound outside the ear-cups, even if you put the headphones around your neck and you've got your music blasting. The bass sound is chunky and satisfying, and the treble is equally excellent. For a fairly minimalist pair of headphones, the sound quality is outstanding. Naturally, you don't have the same technology and audio processing as the Beats by Dre Pro Beats or the B&W P5s, but for the price, it's nigh-on impossible to find fault with the Marshall Majors here. The leather ear-cups are soft and comfy, as is the padded denim headband. At first you might find that the headphones are a bit tight around your head, our inital use gave us a bit of a headache (through a combination of playing with the volume and the slightly vicegrip-like sensation of wearing the Majors for the first time). Thankfully, they loosen up after a bit of use and we've not had any problems with comfort since, even during 2 hour plus sessions. Obviously, there's a plethora of great headphones out there, many of which we rate extremely highly. But we've not seen a pair of headphones that can deliver the same sound - both quality and volume - at this price. Just £100? Wow. They're thoughtfully designed, comfortable and sturdy. In short, they're everything you expect a Marshall product to be and at this price, they're superb.